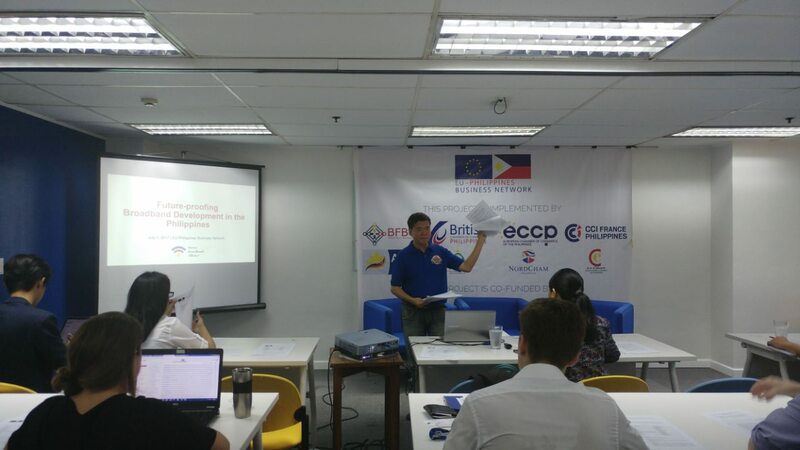 The 14th ICT-BPM-KPM Creative Industries Committee Meeting was held last Friday, July 7, 2017 at the EU-Philippines Business Network (EPBN) as headed by the Committee co-chairman, Mr. Cesar Tolentino. Members from different companies and organizations from the ICT-BPM-KPM industries are present for the day. Ms. Mary Grace Santos of the Better Broadband Alliance presented an informative discussion on the current broadband development in the Philippines, as well as the efforts of their organization in addressing the issue on the betterment of internet services in the Philippines. Furthermore, a presentation by Alvin Sapinoso of the ICTjob.ph portal discussed current challenges of the IT recruitment in the Philippines, including their aims to address the supply/demand situation of IT talents in the country through a creation of a portal. Finally, some of the other salient points discussed in the committee meeting were: (1) feedback from the luncheon meeting with DICT Sec. Salalima last April 4; (2) issues regarding labor sub-contracting and how it affects the industry; (3) the impact on planned tax reform on fiscal incentives for the ICT-BPO industry; (4) the update on the EPBN sector paper for the industry; and (5) updates on the Data Privacy Act of the Philippines.